It’s my cup of tea! Let me treat you a cup of soul soothing aromatic Marrakech Tea and some healthy snacks. Come join me for a Moroccan Tea Time and chat. Why are you always in the rush? Can we just sit down, relax, take our time and enjoy a cup of tea. It will definitely help to unwind, de-congest our mind and come out with a better solutions or ideas right… Now I can have gourmet tea and coffee at the comfort of my home. And I can also organize tea party and invite friends and family members over to my house because finally I have a NESCAFE Dolce Gusto Mini Me machine. Yippieee!!! these are my new love… a love dovey new NESCAFE Dolce Gusto Mini Me machine and the limited edition Marrakesh Tea capsules plus a mug. Tea time is never boring again. Here is my NESCAFE Dolce Gusto MINI ME (black) that is super cute and compact automatic cafe-style beverage machine not only look stylish bit with a 15 bar pump pressure. So now my family and I can enjoy the luxury and ease of brewing a rich and variety of delicious cafe-style coffee and tea in the convenient of my home. I am thinking of proposing to my office to have one NESCAFE Dolce Gusto in our office pantry. That will be perfect! A good cup of tea brings joy and peace. 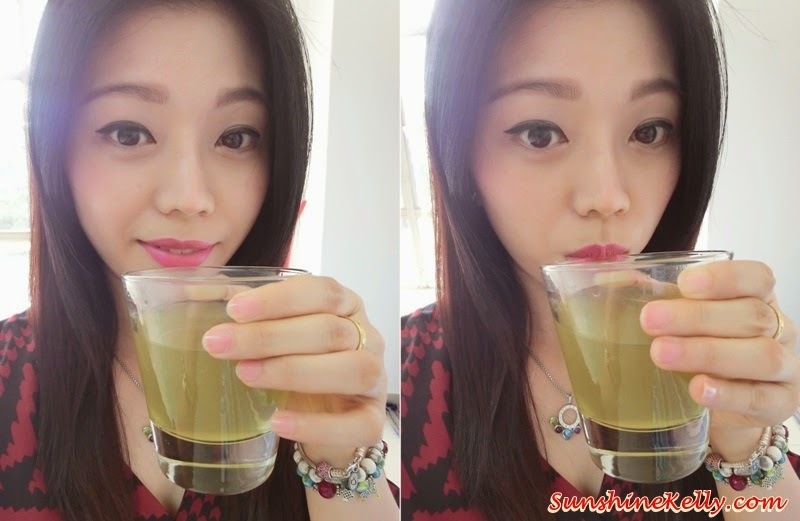 As you know I love to drink coffee but tea especially green tea has lot of anti-oxidant properties and good for health. So I need to have a balance, sometimes a cup of tea gives satisfaction and fulfilling after every sip. Recently, NESCAFE Dolce Gusto launched a series of tea capsules such as Tea Latte, Chai Tea Latte, Green Tea Latte and the new Marrakech Tea. When I heard that they have Marrakech Tea the first thing that come to my mind is that "OMG! I must try it". Let's savour a cup of hot Marrakech Tea, it is an exquisite blend and aromatic of flavours infused with refreshing and smooth green tea with a touch of mint to soothe the throat and its slightly sweetened to gives the perfect Moroccan feels. A cup of hot aromatic Marrakech Tea using NESCAFE Dolce Gusto machine in less than a minute ~ enjoy! I love the smoothness and the perfect blend of this Marrakech Tea. The thought of slightly sweetened the Marrakesh Tea is brilliant and gives a perfect convenience, I don't to add any sugar or milk. It's excellent to drink it just like this, exotic! The Marrakesh Tea is perfect for anytime and anywhere. For breakfast, tea time, break fast or after meals. Especially after a heavy meal a cup of Marrakech Tea is superb to ease the stomach as the mint helps in digestion. Here I have prepared some tea and healthy snacks, come join me for a Moroccan Tea Time at home hehehe... this is my Sunshine Daily Recipe, i always whipped up what I can find in my fridge and kitchen cabinets. So today I am preparing an open faced avocado & tuna sandwich with a twist. I'm using the Roti Kering instead of the normal bread. Hey by the way, Roti Kering or dehydrated bread is the crispy with a light spread of butter and sprinkle with a bit of fine sugar. Since childhood until now I always love to dip my Roti Kok into my milo, coffee or tea. It can be quite addictive. Have you try Roti Kering before, do you like it? Have you try open faced Avocado & Tuna Roti Kering Sandwich? I have organic avocada, spicy tuna, tomatoes and chia seeds for my sandwich. Just cut and slice the avocado and arrange it in love shape, spread a spoonful full of spicy tuna on the Roti Kering, add a small slice of tomatoes and sprinkle some chia seed on the avocado. All the ingredients that I used has high anti-oxidant, omega-3, good for our skin and health. I have incorporate chia seeds in my diet. Don't underestimate this chia seeds, it contains calcium, manganese, and phosphorus, and is a great source of healthy omega-3. Tadah! presenting my simple and easy to prepare Moroccan Tea Time Set - delicious open faced avocado & tuna roti kering sandwich, luxury Bateel Dates and my aromatic supreme Marrakech Tea ~ bliss. Just take less than 20 minutes to prepare all these. So now you can always enjoy a cup of cafe style tea with easy to prepare and healthy snacks at the comfort of your home. Muacks! 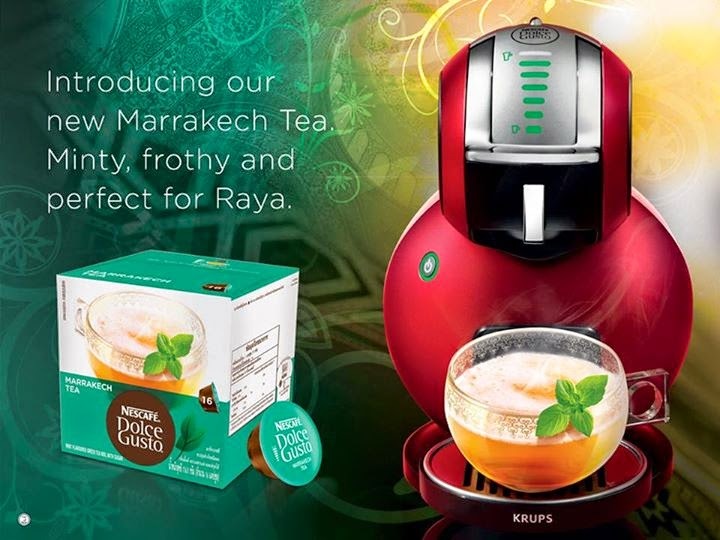 NESCAFE Dolce Gusto brings you a Moroccan inspired Raya celebration by introducing their new and limited edition Marrakesh Tea. Packaged in a capsule form and it comes in a box of 16 capsules priced at RM27.99 per box. The NESCAFE Dolce Gusto machine comes in 4 stylish models (Mini Me, Genio, Melody and Circolo Automatic) and a variety of colours to choose priced from RM499 onwards. This is the only single-cup coffee machine that delivers a professional 15 bar pressure for a perfect Espresso and fine milk forth for a velvety Cappucino all in one. Fast and convenient to enjoy a cup of gourmet beverages in less than a minute. 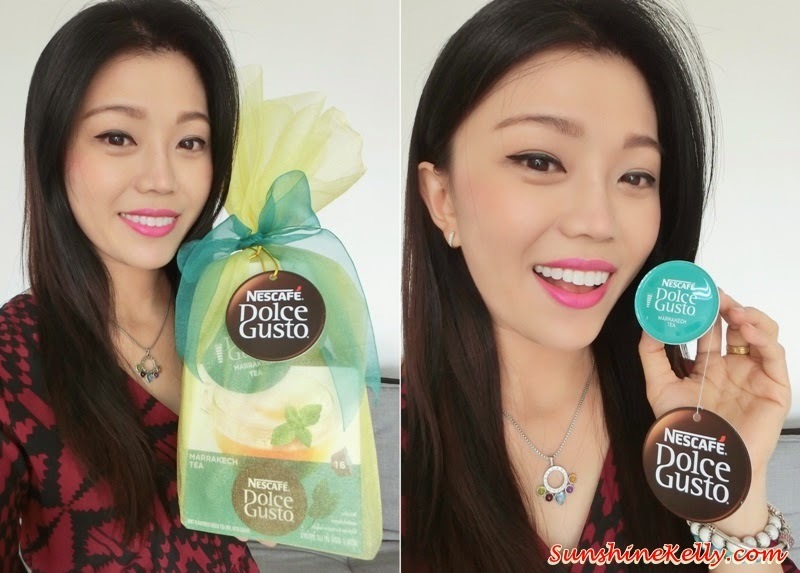 NESCAFE Dolce Gusto Exclusive Raya Offer! All you have to do is purchase a NESCAFE Dolce Gusto machine and stand a chance to win a special Salam Raya Gift Set which consists of a Genio 2 machine complete with a variety of capsules worth RM850 of NESCAFE Dolce Gusto products. This contest is valid until 22nd July 2014 only so if you are keen to have one at home faster get it before the contest is over. Buka Puasa Tips: Ice Marrakesh Tea and dates are one of the good combination to break fast... it is refreshing! Let the cool mint tea fresh up your breath and soothe your dry throat; the lightly sweetened gives you some energy and the benefits of drinking green tea to hydrate your body. How about a cup of hot aromatic Marrakesh Tea at home with your love ones? Buka Puasa Tips: Drinking Iced Marrakesh Tea is a great way to break fast... totally refreshing and satifying! Let the cool mint tea fresh up your breath and soothe your dry throat; the lightly sweetened gives you some energy and the benefits of drinking green tea to hydrate your body. Cuba lah! Great machine makes great tea! Nestcafè dolce gusto is an excellet method to drink a magnificient tea! Aaah yes, agree that chia seeds are great superfood. Heals the muscles & keeps one full. Good add-on for breakfast! I have tried various coffee & tea from Dolce Gusto before. Seems lk they are introducing more new variety. It's a good machine to have esp in the office or even at home since it prepare everythg at a go of a button & easy to clean. oh.. my dear talk about this machine.. hehe.